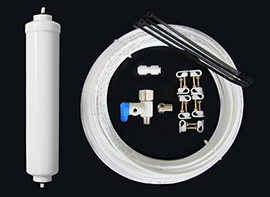 The Pentek GS-10RO inline filter and water-Line Install Kit for D7, D9, D14 & D16 Water Coolers. Complete parts needed for installing an inline water filter for your Clover bottleless water cooler, as well as complete parts to install a water line from your water source to your water cooler. The Pentek GS-10RO filter features coconut shell, granular activated carbon, and is designed to reduce unwanted taste, odor and chlorine taste and odor. All traditional In-Line filters include a durable, injection molded polypropylene body and cap, pre- and post-filter. They are pressure rated to 125 psi.